Place 1 chicken breast half, boned side up, between 2 pieces of plastic wrap or waxed paper. Working from center, gently pound chicken with flat side of meat mallet or rolling pin until about 1/4 inch thick; remove wrap. Repeat with remaining chicken breast half. Place chicken breast halves in large nonmetal dish or resealable food storage plastic bag. Add 1/4 cup salad dressing and chives; stir or turn bag to coat. Cover dish or seal bag. Refrigerate at least 2 hours to marinate, turning occasionally. Heat grill. When ready to grill, remove chicken from marinade; reserve marinade. Place chicken on gas grill over medium heat or on charcoal grill 4 to 6 inches from medium coals; cover grill. Cook 8 to 10 minutes or until chicken is fork-tender and juices run clear, turning once and brushing occasionally with reserved marinade. Discard any remaining marinade. To toast buns, place cut sides down on grill during last 1 to 2 minutes of cooking time. Place cheese slice on each chicken breast half; cook just long enough to melt. Spread bottom halves of buns with 1 tablespoon salad dressing. 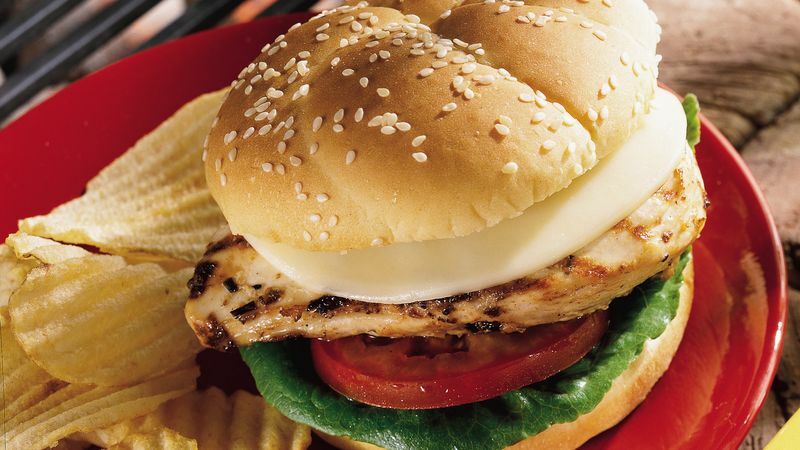 Top each with lettuce, tomato and cheese-topped chicken breast half. Cover with top halves of buns.